It’s no use. There are too many people in the party with a tilt toward the United States. So you want to lead the life of a whore and have a ceremonial arch erected to commemorate your chastity! Don’t think the Chinese people don’t see and understand what’s going on! Any country that befriends China will end up the loser. We’ve lost a friend and gained an enemy. When you drop stones on somebody who’s fallen in a well, you’re worse than a pig or a dog. Once Iran is sanctioned, America will start to classify China as a currency-manipulating country. When the bird is shot, the fine bow is put away; when the rabbit is caught, the hunting dog goes into the cooking pot. Wake up, comrades! Interesting. The CCP has a very sophisticated approach toward encouraging the participation of “netizens” in public discourse. Of course the approach contains some very firm red lines regarding taboo topics. But the CCP also seems to use the discussion boards in which netizens participate as a useful sounding-board for the opinion of educated, well-connected citizens. So it’ll be interesting to try to figure out the extent to which this fairly scathing set of netizen reactions to Beijing’s diplomacy has any discernible effect on policy going forward. Fellow “Wahoo” and good friend Barin Kayaoglu, writing in the Turkish Weekly, goes a step deeper in considering the state of US-Iran nuclear negotiations. “The graves of fathers, mothers, brothers, and sisters at these places are somber reminders of the real price of war. The BBC this morning carries a curious item about Iran moving its capital city away from Tehran. It’s not a particularly new idea, and a geo-physical argument exists to support such a dramatic change. Yet recent political earthquakes may also be involved in the calculation. The article buys into the misleading, if all too common Western sense of Tehran being more “liberal” and politically restive than the rest of the country. Right-o…. Tell that to Tabrizis. In any case, maybe now we know the “real reason” why urban planners are such hot potatoes inside Iran. Hey, maybe this news could provide a “constructive” pathway to free Kian Tajbakhsh — to help with this whopper of an urban planning project. MTV (Music Television) “University” has selected Simin Behbahani, “the poet who never sold her soul or her pen,” to be its second poet laureate. For a visually challenged 82-years-young Iranian, how cool is that? Beginning Monday, Nov. 2nd Behbahani’s poems will be featured on MTV-U in a series of 19 short films. Yet it is Behbahani, the reputed “Lioness of Iran,” who will now re-introduce millions of the world’s youth to Iran, through the medium of rock ‘n roll, music television, in her universal voice. Martin also notes how none of this would have been possible were it not for the literary skills and devotion of Professor Farzaneh Milani. Her translations bring Behbahani’s “iconic” poems to life in English. If Behbahani is Iran’s national poet, Milani has rendered her the world’s. to pay homage to being, you must sing…. Jackson Diehl finally loses his sanity? What happens to someone when he lives in, and imbibes the air of, the Washington bubble for so darn’ long that he completely forgets what the real world looks like? Well, read Jackson Diehl’s piece in Sunday’s waPo, and you can get some idea. The guy has completely lost touch with the real world! The Obama administration’s positive tone following its first diplomatic encounter with Iran covers a deep and growing gloom in Washington and European capitals. Seven hours of palaver in Geneva haven’t altered an emerging conclusion: None of the steps the West is considering to stop the Iranian nuclear program is likely to work. Not talks. Not sanctions, even of the “crippling” variety the Obama administration has spoken of. Not military strikes. And probably not support for regime change through the still-vibrant opposition. Who is he hearing this from? If it is not the voices inside his own sad head, it must be a small coterie of like-minded people who are all that he talks to these days. I’ve talked to plenty of people in Washington in the past coupe of days. They have all been– to some degree or another– moderately excited by the outcome of Thursday’s P5+1+1 talks in Geneva and hopeful that those talks might help ramp down the tensions between Washington and Iran, avert war, and lead to a more sensible set of relationships between Washington, Iran, and the rest of the world. I guess we don’t talk to the same people. But now, it’s gotten so that Diehl hears only the voices inside his own head and those voices of others that he can portray as echoing his own idiosyncrasies. What of Thursday’s talks in Geneva? Iran agreed to international inspections of its new nuclear facility and to ship out of the country some of the uranium it has enriched. Yet those modest concessions may complicate the negotiations and the prospects for sanctions. The headlines about them already obscured the fact that Tehran’s negotiator declined to respond to the central Western demand: that Iran freeze its uranium enrichment work. Iran has rejected that idea repeatedly, and there is no reason to believe the hard-liners in power will change their position. In the meantime, talks about the details of inspections and the uranium shipments could easily become protracted, buying the regime valuable time. (On Friday the Associated Press quoted a member of the Iranian delegation as saying it had not, in fact, agreed to the uranium deal.) Meanwhile, Tehran’s tactical retreat has provided Russia and China with an excuse to veto new sanctions — something they would have been hard-pressed to do had Iran struck an entirely defiant tone in Geneva. The sad thing is that Jackson Diehl is not just some individual, unconnected voice on the op-ed page. He’s the deputy editor of the WaPo’s editorial page, and for some reason is regarded as a serious voice on foreign affairs throughout much of he Washington political elite. I guess the new spirit of realism that has been slowly seeping through official Washington has passed him by. Correct that: not merely passed him by, but actually left him very deeply disturbed indeed. As a result, he has retreated even deeper into some neocon-inspired “American Uber Alles” dreamworld, quite unaware that in reality the fate of the country we both love is nowadays deeply interdependent with the fates of non-western powers like China, Russia, and so on. Deal with the fact that American citizens, constituting less than 5% of humanity, do not have all (or even most) of the answers for all of humankind and we are no longer able to impose our will on the other 95% in the same way that Pres. G. W. Bush so thoughtlessly and arrogantly did– with your enthusiastic approval– for all the years he was in office. The world’s changed, Jackson Diehl. It would be kinda nice if either you or the WaPo could recognize that and give the new facts of slightly more equal human powers in the world some due recognition. It would also be great if you could acknowledge and even welcome the fact that, since Thursday, there is serious new hope for de-escalating the tensions between Washington and Iran, and building a new, less conflict-ridden (and therefore, much more humane) set of relationships in the Middle East and Central Asia. But I, for one, am not going to hang around and wait for you to come to that relaization. Hanging on the every-last-word of the WaPo and its much-vaunted editorial-page team does seem, after all, so very twentieth century. Author HelenaPosted on October 3, 2009 Categories Iran5 Comments on Jackson Diehl finally loses his sanity? It’s here. Also archived here. In 2003, Russia and China were unable (both in strictly military terms, and in terms of global power equations) to block the invasion of Iraq. But since 2003, Russia has stabilised its internal governance considerably from the chaotic state it was still in at that time, and China has continued its steady rise to greater power on the world scene. Two developments over the past year have underlined, for many U.S. strategic planners, the stark facts of the United States’ deep interdependence with these two significant world powers. One was last autumn’s collapse of the financial markets in New York and other financial centres around the world, which revealed the extent of the dependence the west’s financial system has on China’s (mainly governmental) investors. The other turning point has been the serious challenges the U.S. faced in its campaigns against Islamist militants in Afghanistan and Pakistan. Earlier this year, Pakistani-based Islamist militants mounted such extensive attacks against convoys carrying desperately needed supplies to U.S. troops fighting in Afghanistan that Washington was forced to sign an agreement with Moscow to open alternative supply routes through Russia. Russia and China both have significant interests in Iran, which they are now clearly unwilling to jeopardise simply in order to appease Washington. Thursday brought dramatic evidence of the growing weight of non-western powers in policies toward Iran. What is still unclear is when there will be evidence of any parallel growth in their influence in Arab-Israeli peace diplomacy. Barak said “Israel is strong, I don’t see anyone who could pose an existential threat,” although he did add that he viewed Iran as a challenge to the whole world. 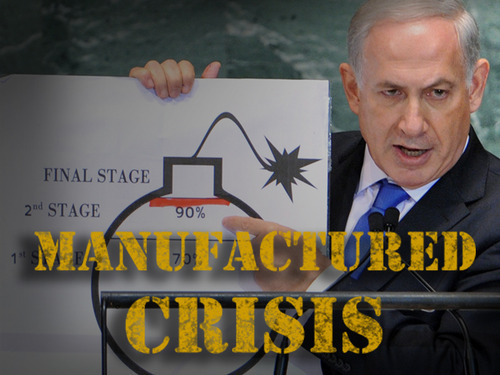 Israel is assumed to possess the only atomic arsenal in the Middle East. I would modify that a bit. Israel’s is the only ground-based nuclear arsenal in the region that we know of. However, a portion of the US Navy vessels plying the region’s waters can also be assumed to have them. Still, it is excellent that Barak is on the record with this statement. * Update: But MJ Rosenberg noted this in his very informative post on the topic at TPM Cafe. On September 12, 2001, as US military planners started examining the options they had t counter-attach against Al-Qaeda and its hosts in Afghanistan, they and their colleagues in the State Department rapidly realized that if they wanted to actually topple the Taliban regime in Afghanistan they’d need the help of two key nearby powers: Iran and Russia– and to a lesser extent, India. They got the help they needed from those regional actors, and went ahead with the invasion operation. The 95,000 US/NATO forces in Afghanistan are already significantly dependent on Russia and Iran, to be able to maintain their presence in that craggy and distant land. If their commanders are to avert the many worse catastrophes that loom there, they will need even more help from both Russia and Iran. That is part of the essential background to the decision the State Department announced yesterday, that the US will be participating in the meeting that the Tehran government proposed Wednesday, between Iran and the P5+1 group. Iran reiterated many of its previous ideas for talks while scaling back specific requests made in previous proposals  (PDF). Among other things, Tehran called for an end to hostilities and for talks on issues of specific concern to Iran, such as drug trafficking and security in the Middle East. Unlike previous Iranian proposals, this one does not contain a litany of past grievances with the United States and does not assert an Iranian commitment to advancing its nuclear efforts. On Friday, Russian PM Vladimir Putin expressed his country’s clear opposition to any further escalation of outside pressure (whether sanctions or military force) against Iran. There is now confirmation from Tel Aviv that Israeli PM Netanyahu made a secret visit to Moscow shortly before Putin announced this decision. If, as we can assume, he discussed the Iran file while there, then evidently he failed to prevent Putin from making that clear decision against escalation. The Israeli government and its many powerful and well-organized supporters inside the US have been vigorously campaigning for all non-Iranian powers– especially the western governments– to ratchet up the level of pressure they place on Iran. Today in Israel, Israeli Deputy Prime Minister Dan Meridor, who is also Minister of Intelligence and Atomic Energy, gave an interview to Reuters in which he seemed somewhat seriously behind the curve, still arguing that Russia and China might get on board the anti-Israel campaign. I doubt it. Maybe it’s time for Israel and its supporters in western countries to grow up and take a realistic look at the fact that within the world community that needs to make the decision on this matter they are in a very small minority. And quite evidently, very few people– even in the strongly pro-Israeli United States– will be in a mood to forgive Israel if its actions towards Iran put at risk the lives of 60,000 US service members in Afghanistan.